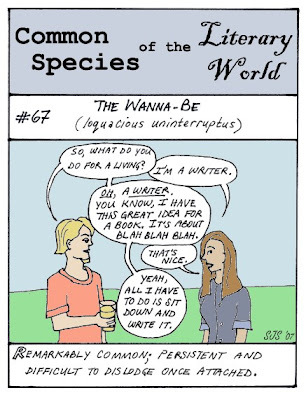 Finding Wonderland: The WritingYA Weblog (archive): Toon Thursday: It's All About the B.I.C. Toon Thursday: It's All About the B.I.C. Man, I got this one up in record time. I may have missed Thursday anywhere that observes Greenwich Mean Time or later, but in the U.S. of A.--contiguous and non-contiguous--I'm still doing great. Then again, I am procrastinating about the revision of my last three YA novel chapters. The main problem is that I think I have to completely gut and rewrite the last chapter. The ending, people!! ARGH!!! The thought of rewriting the ending is seriously making me ill. Not because I so love the current ending, but because of the mental effort involved, and my desire to make it perfect. So I think I'll procrastinate just a little more, and go back to designing a poster for a local production of Pig Farm...Yup, that's the ticket. But before I do, here's a Most Egregious Misuse I saw yesterday on my way to the post office. In the window of a Perko's diner I saw a sign reading "Ham and Egg's Breakfast $3.99" or some such terrible misuse of an apostrophe. Grr. Congratulations on the Pig Farm gig! The One Shot World Tour: Best Read With Vegemite! BACA: Because you wanted to know this! Poetry Friday: Late, But Here!